Shop safely and reliably in either our direct store www.bell-laser.com For financial transactions, we accept all major credit cards and Paypal, using the Paypal Electronic Invoicing System. The Paypal secure system protects buyers and sellers alike. We also accept the digital currency BITCOIN. The digital currencies are preferred, as they keep our costs down (saving about 5 percent), and enable us to keep our low prices and not raise them. 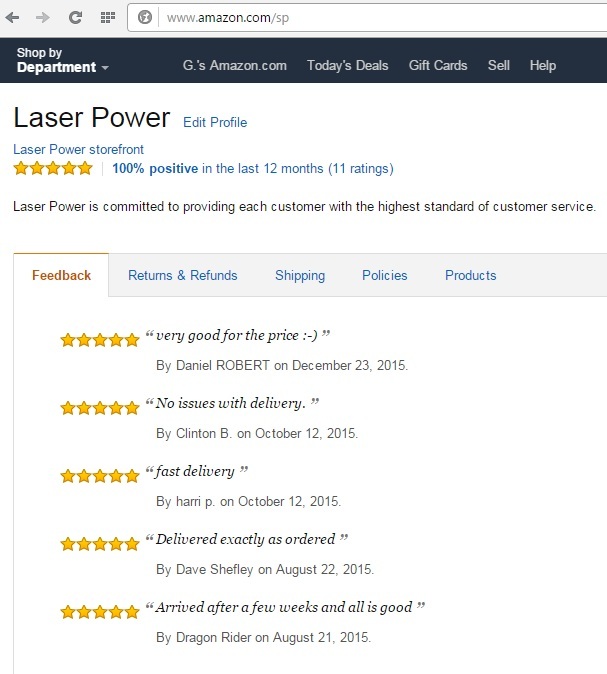 See our many satisfied customer reviews on the Amazon store web pages. Note, on Amazon, not all items are in stock, however, all items always in stock in our direct store. We hope that you will join our many satisfied customers by purchasing items that improve your business and make operating a laser engraver/cutter easier, and with higher quality. The store catalog is regularly growing with new products, so check back often! Rebates provided for your dead/old/obsolete USA laser engraver parts. Buy anything and qualify for rebates (yes, you can combine them). For Speedy 300, 360, 400, & 500: B-Store. Chinese machine Power Supplies (calibrated). Includes options for laser tubes w/mounts. Upgrade now! Trade-in $ for old CO2 laser parts on Upgrades!